Keeping your machine in top shape requires just a few simple supplies and a few minutes each day, week or month depending on how much you sew. Keep It Covered - Dust, lint and animal hair can cause all sorts of problems, especially for the printed circuit board of a computerized machine. So, keep your machine covered and away from windows and vents. Needle Management - Replace needles after every four hours of sewing time. Use needles that are compatible with your fabric and thread. Wind Bobbins Correctly - Be sure there are no thread tails hanging from the bobbin when its inserted into the bobbin case. They can jam the machine and cause the upper thread to break. Use a can of compressed air to remove loose particles from around the tension disks and other parts of the machine. (Don´t blow into your machine yourself because breath contains moisture which will cause corrosion. Contributed by Wayne Benton - SewTech International, Inc. I am often asked how to schedule the necessary maintenance on machines in order to make it easier to understand, or at least easier to follow. The best way is to make a calendar with all pertinent information scheduled as per your instruction manual recommends. When scheduling preventive maintenance be sure to remember that it’s not all oil and grease. Quite a bit of cleaning is needed as well. This is often overlooked and can turn out to be the culprit when problems do appear. What works well is to designate the last 30 minutes of a shift as clean up time. This gives the operator plenty of time to blow out the machine and do the oiling as needed. If you take the time to clean at day’s end, your mornings will be surprisingly free of thread breaks. When the accumulated dust-lint-oil is allowed to dry overnight, it causes sewing problems for the first part of the day until it softens enough to allow the machine to work it loose from the hook race. I strongly recommend an air hose close to every machine, if an operator must first pull an air compressor over to the machine, then put it away, well, let’s just say they tend to cut corners and the job does not often get accomplished. Providing the proper tools as well as training will help alleviate these discrepancies. © 2003 SewTech International, Inc. If you don´t already have a technician to service your embroidery machines and help you with your software, freeEmbroiderystuff has a resource called Technician´s Corner that you can use to find one in your area. There are over 100 experienced and certified technicians to choose from with every make of embroidery machine represented. Click Here to search for one now. EmbroideryDesigns.com has compiled the most useful and complete list of embroidery machine manufacturers and their dealers on the internet. This list includes commercial and home machines. Just select your machine brand from the drop-down menu and get contact information for the manufacturer and all of their dealers. We also give you a link to their website and an easy way to order their catalog. Click Here now to try it out. It is the little things that will keep your machine operating smoothly. Keeping your machine clean, well oiled and free of unwanted needle-hits is essential. Still, you will experience mechanical problems. If your machine is not sewing properly, don´t assume that something is wrong with the hook timing. This is one of the last things things you should check when your machine is not sewing right. Look for the simple and more obvious things first, such as tensions, threading, burrs in the thread path, bent presser feet and so on. If these don´ t prove out, then check the needle depth. You know you have a needle depth problem when you see skipped stitches, frayed thread or failure of the needle to engage. Checking the needle depth is fairly simple. Remove the bobbin case, roll the needle down to its lowest point and look up into the hook basket. If you see the eye of the needle or more you have a deedle depth problem. You should only be able to see the tip and half of the eye protruding into the basket. Adjust the needle depth by loosening and then raising or lowering the needle bar driver or reciprocator (the piece that drives the needle up and down) to the proper depth. You should also check the other needles on the head to be sure they are engaging properly. Many machines have an adjustment for needle bar height to ensure each needle engages properly. If this does not fix the timing problem, consider timing the hook. To time the hook, remove the throat plate and rotate the needle to its lowest point, then raise the needle. As the needle rises 2 to 3mm, the point of the hook should cross behind the needle. It should cross behind the needle in the middle of the scarf of the needle ( the little indentation on the backside of the needle.) Most machines have a degree that you can turn the machine to for the hook timing. Contact your machine vendor for the exact degree setting of your machine. If the hook does not cross behind the needle in the middle of the scarf, you will need to loosen the three screws that fasten the hook assembly and re-position the hook until it does. When repositioning the hook, remember you are actually setting two things: the timing (when the hook comes behind the needle) and the hook-to-needle gap. Set this at about half a millimeter. "Tough to see that", you say? Well, try this little trick. Turn your needle around backwards. Then bring the point of the hook up to where it just grazes the needle. This way when the needle is turned back around properly (don´t forget! ), it should be the correct distance away from the hook. You then tighten the hook and that is it! If you are still experiencing problems such as thread breaks immediately following a trim, you may have trimmer trouble. Trimmers normally get out of adjustment by some sort of sewing error. Many times they are thrown out by trying to trim through a bird´s nest of threads. They can also get out of adjustment by failure to keep them clean. The key to solving trimmer problems is observation. Watch and see how the trimmer is malfunctioning. Is it cutting too short, causing the machine to un-thread when starting back up after the trim? Is it not cutting at all, making the picker or slider hang up? Is it hesitating during the trim cycle? Different brands of machines have different trimmers but there are a few areas that can be looked at on most systems. 1. The Trimmer Fork is the little metal fork that sits right in front of the bobbin case. Its job is to pull the thread out of the hook during the trim cycle, allowing it to be cut. If you watch it during a trim cycle, you can see a little triangle being formed between the two prongs of the fork and the needle hole. If this triangle is not formed, the thread will not cut properly. The fork should go in above the bobbin case as far as it can without touching anything. 2. The cutting blades should be checked to be sure thay are not broken or dull. Often the thread will dull one spot on the blade where it hits all the time. Hone the dull spot or replace the blades as needed. 3. Most machines use a scissor-type action to cut the thread. They have a fixed blade and a moving blade. The moving blade will cycle forward and grab the thread from the trimmer fork and then pull it back across the fixed blade. If the moving blade is out of position, it will either be too far back, not allowing the blades to be close enough to properly cut the thread, or it will be so far forward that it can overlap the blades, causing a jam or cutting the thread too short for a clean start after the trim. Click here for an embroidery Test Stitch Evaluation Sheet in PDF format courtesy of Creative Machine Embroidery magazine. Towels Place monogram on opposite side of label on opposite end (measure from monogram bottom) Rinse away topping is recommended. Bath Sheets 3" above border or 4" above hem. Bath Towels 2" above border or 4" above them. Wash Cloths 1" above border or 1.5" above hem. Sheets Bottom of monogram centered about 2" above wide hem line on top side. Pillow Cases Center on the open side between the edge and the hem´s border. Cuffs For top center of wrist, start 1" from cuff center toward buttonhole & .25-.5" above cuff edge. Bottom of letters should fall at cuff bottom. Size: .375-.25" fold the left cuff in half across the width. Embroider 1" from fold toward buttonhole & .25" from cuff´s topstitching. Collars .25" above button hole on left side centered between collar edges size: .375-.25"
Pockets Center of pocket hem .25-.5" from pocket top. If flap center or If button closure/flap then slightly to right of button hole. Size: .375-.25"
Ties 1.5 to 2.5" up from the tie´s bottom tip. If wearing a vest then 9" to 11" up from the bottom tip. Size: .25 - .5"
Sport Shirts On left side 7.5-9" from shoulder seam and halfway between placket and sleeve seam. Size: .25-.5"
Robes 7-10" from shoulder seam and 3-5" from center. Collar Left side .25" above button hole centered between collar edges size: .375-.35"
Cuff Fold the left cuff in half across the width. Embroider 1" from fold toward buttonhole & .25" from cuff´s topstitching. Size: .375-.25"
Pocket Center of pocket hem .25-.5" from pocket top size: .25-.5"
Left Side Left side 4-6" from shoulder seam & halfway between placket or center and sleeve seam. Size: .25-.5"
Blouses 4-6" down from left shoulder seam and 3-5" from center Size: 1-1.25"
Sport Shirts On left side 3.5-4.5" from shoulder seam and halfway between placket and sleeve seam. Size: .25-.5"
Robes 4-6" down from left shoulder seam and 3-5" from center Size: 1-1.25"
Sweaters 3.5-4.5" down from collar and centered on front. Golf Shirts 7.5-9" down from left shoulder seam and 4-6" over from center. Satin Jackets Left chest 3.5-4" over from center edge and 6-8´ down from shoulder seam back dependent on design/jacket size. Centered 6-9" down from collar seam. Furs/Coats Right side at waist level in the lining 3" from lining seam size: 1-1.25"
Caps Front/Center, 1.5" above the brim. Left Chest 3.5 to 4" over from center´s edge and 6 to 8" down from the seam of the shoulder. Back Depends on jacket and design size. 6" to 9" down from the seam of collar to the design´s center. Left Chest Draw imaginary vertical line from top of shoulder down and then horizontal line through middle of sleeve. Correct placement where lines intersect. Polo Shirts 7.5 to 9" down from the shoulder´s left seam and 4 to 6" over from the center, in line with the collar meeting the shoulder seam. Reference with the center placket. Tee Shirts 7.5 to 9" down from the shoulder´s left seam and 4 to 6" over from the center. Sweatshirts Top of the design 3 to 3.5" down from the bottom of neck´s edging. Turtle Necks The left neck area should be centered between center front and shoulder´s left seam. Design´s bottom .5 to .75" up from bottom edge. (Don´t forget you may have to rotate 180 degrees). This Tip Courtesy of Pantograms Manufacturing Co., Inc.
Underlay is a group of running stitches that are used to hold the garment to the backing during the embroidery process. These stitches add stability to the embroidered garment and prevent the fabric from moving. Generally, the higher the column width, the better the underlay should be. There are 3 underlay options available: Center Walk, Edge Walk, & Narrow Column. Center walk places a running stitch down the center of the column. Edge walk is primarily used for columns with wide widths and with the Split Satin option. This underlay provides more stability than Center Walk because it places a set of running stitches down the edge of the column. The percentage is gauged from the center working out. A good starting point for lettering is approximately 60% for script and 65% for non-script. Narrow column may be used for letters that will embroider in a complex fill. Generally, the underlay density is between 1/4 and 1/5 of the letter´s density. Narrow column may also be used in small lettering with the top density decreased more than the guidelines or it may be used to raise the lettering with a higher underlay density. Stitch length is the measurement between needle penetrations in the underlay. The stitch length depends on the height of the letter. The larger the letter the higher the stitch length. up to .50" = .079"
.51" - .75" = .098"
.76" - .99" = .118"
1" and larger = .157"
up to .25" = .079"
.26" to .50" = .098"
.51" to .99" = .118"
Equipment that is less than 2 years old and that has been completely checked by a qualified technician, can provide a significant price reduction as compared to buying the same equipment new. Machines in excellent condition usually sell for between 25% and 75% of the cost of new equipment. Buying used equipment requires a much lower capital investment than buying new equipment which results in a quicker payback and a higher return on your investment. Buying new equipment usually requires long lead times. When this is taken into consideration, used machines, accessories and software offer a very attractive alternative for the shop that has immediate needs for additional capacity. Used equipment is usually available for immediate shipment. A knowledgeable dealer can often locate equipment that is close to you, thereby reducing or eliminating shipping costs. Used equipment typically has a significant economic life remaining since it is usually less than 2 years old. It is usually on the market for reasons that have nothing to do with the equipment itself: It is no longer required; The business is moving or closed; The owner has found itself in dire financial straits and the machine has been re-possesed by the leasing company or bank. What are the benefits of leasing equipment? Your cash is retained for more profitable uses such as inventory discounts, marketing, additional staff and additional production capability. It also keeps existing bank lines of credit open for other uses. Properly structured lease payments may be 100% tax dedubtible business expenses, paid from pre-tax earnings instead of after-tax profits. Unlike a bank loan, leasing can provide 100% financing with no down payment. Taxes, delivery, service contracts and other costs not typically financed by a bank can be included in the cost of the lease. One or two payments in advance are usually all that is required. Leased equipment costs are predictable and can be more easily measured against the income new equipment is expected to produce. Leased equipment is expensed over a fixed period of time and is more easily replaced before obsolescence and physical deterioration takes place, so devaluation is avoided. Lease Payments are based on the dollar's current value. These payments remain constant regardless of the future effect inflation has on currency value. Remember 1980, when interest rates skyrocketed from 9% to 21.5% in a single year? Unlike bank lines of credit with variable rates, lease payments are fixed regardless of what happens to the market tomorrow. Capital budget restrictions, new tax reform preference items and extension of current lines of credit are some of the most common reasons that many commercial industries look to lease financing as an attractive alternative to paying cash for new capital equipment. Downloading free embroidery designs is a great way for you to try out the work of professional digitizers from all around the world. EmbroideryDesigns.com and many other sites offer hundreds of new designs each month. Downloading designs is usually a simple task. However, if you are unfamiliar with the process, there are a couple of things that you need to know in order to avoid potential frustration. First, most designs are downloaded in a compressed or "zipped" format. This is done to minimize the time it takes to transfer the file across the internet. Once you receive the file you need to unzip it using a program such as WinZip. How do I know if I have a zip file? By looking at the filename extension i.e. "loginname_ordernumber.zip (example: joe_1203.zip)"
A ZIP file allows you to store and reduce the size of files contained within, therefore speeding up your download time. Older operating systems required you to download and install software such as WinZip in order to open a ZIP file, but modern operating systems have built-in functionality for opening these files. Please select the operating system you have below to see instructions to open a zip file. Windows XP and newer editions of Windows already has support for opening zip files. Windows XP and newer editions of Windows calls zip files compressed folders. 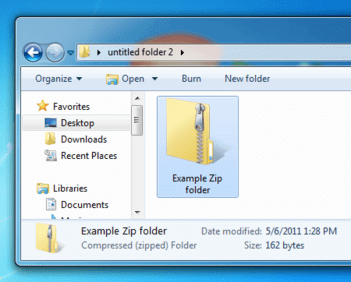 When you open a zip file in Windows Explorer, you will see the contents listed just as if it was an ordinary folder. You can drag and drop the contents to an ordinary folder before opening or running them. Step 2: Double-click the ".zip" file. This will extract the file or folder contained within the file. Note: The original compressed files will remain within the ".zip" file. Step 3: Once you have the file open you can then drag the files to whatever location you would like such as your floppy or disc drive or a local location on your computer. There is no built-in support for opening zip files in versions of Windows that preceded Windows XP. There are numerous zip file managers available on the Web, almost all of which support the zip format. Step 1: Locate the ".zip" file on your computer. Step 2: Double-click the ".zip" file or right-click (or control+ click) the ".zip" file followed by "Open" from the contextual menu. Macintosh users have to survive with OS Archive Helper. 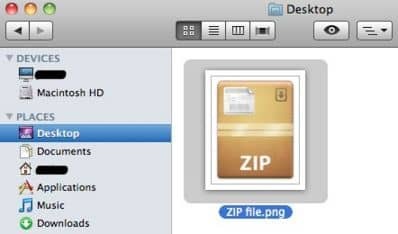 This article briefly describes free, open source utility Zipeg that Macintosh users can user to open and extract (unzip) RAR and ZIP files.